Baked pasta is delicious. 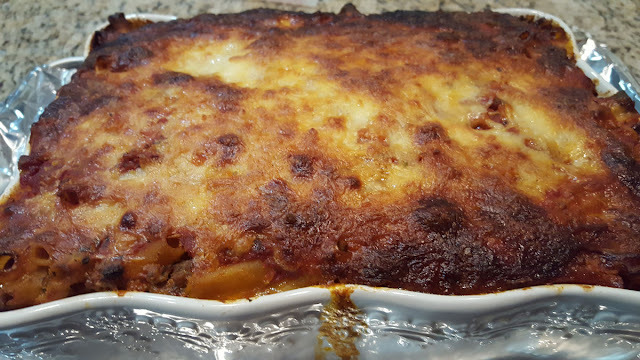 One of my favorite baked pasta casseroles is Baked Ziti. 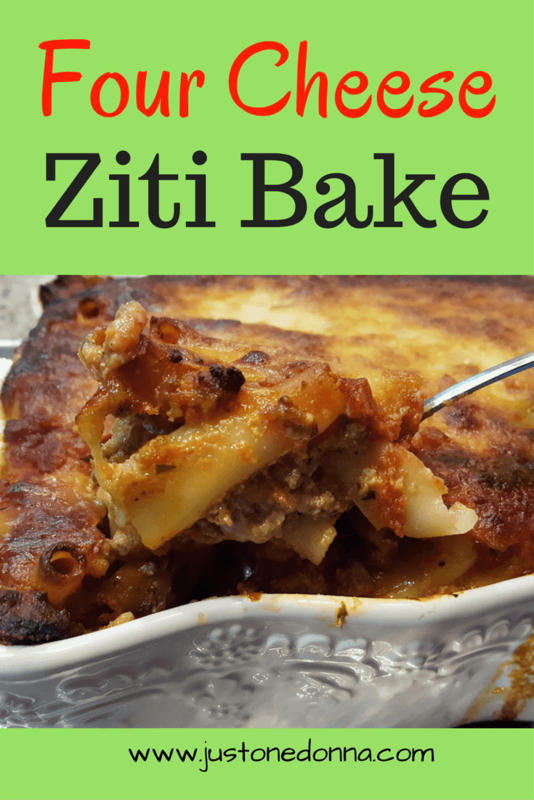 You can make baked ziti a hundred ways, but today I want to share my four cheese baked ziti recipe. The four cheeses you'll find in this recipe are ricotta, mozzarella, Parmesan, and Romano. Yum! This post contains affiliate links for your convenience. When you choose to make a purchase through one of these links I receive a small payment that supports the costs to publish this blog. 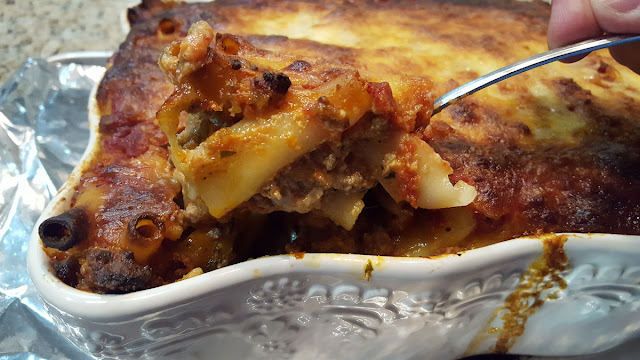 This recipe makes a large ziti bake that will feed a crowd. That makes this a perfect recipe for potlucks and family gatherings. If you don't need to feed a crowd, divide the ingredients between two baking dishes. Bake one for dinner and freeze the other for another day. This is a multiple steps recipe, so to cut down on my time in the kitchen I like to use jarred sauce. I use two twenty-four ounce jars of my favorite brand. Trust me, no one will know. The flavors in this ziti bake blend together beautifully. Be sure to taste all of your ingredients as you go. That way you'll know how much additional seasoning you need to add. The recipe as written will please most people, including the little ones in your life. If you'd like a little more spice, choose and Italian sausage with a little heat and add 1/4 to 1/2 teaspoon of crushed red pepper. Heat the olive oil in a large skillet. Add the onion and cook for three to five minutes. Add the ground beef and sausage to the skillet. Use a wooden spoon to break the beef and sausage into small pieces. Cook over medium to medium-high heat, stirring occasionally. After a few minutes add the garlic and stir to distribute. Season with salt and pepper. Continue cooking until the meats are browned and little bits have begun to stick to the bottom of your pan. Drain. 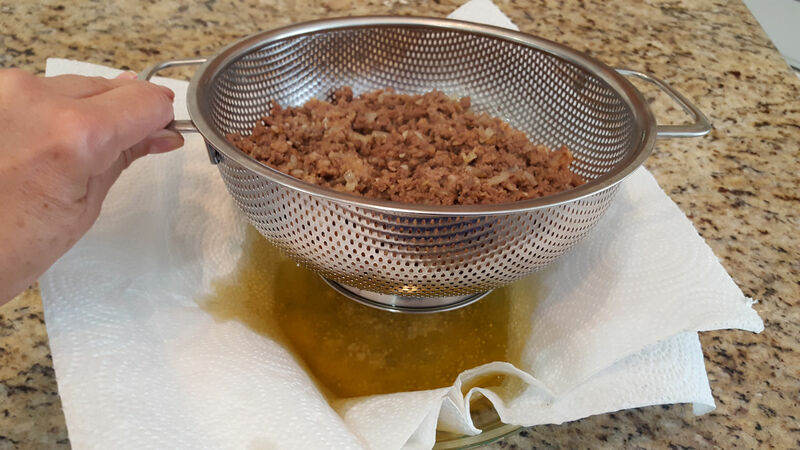 Tip: Drain the meat mixture by putting it in a colander set into a pie dish lined with paper towels for easy cleanup. Cook the ziti according to the package directions but for one to two minutes less than recommended. Save one cup of the pasta water before draining. While the ziti is cooking, mix together the ricotta cheese, eggs, and parsley. Shred the mozzarella cheese with a box grater. 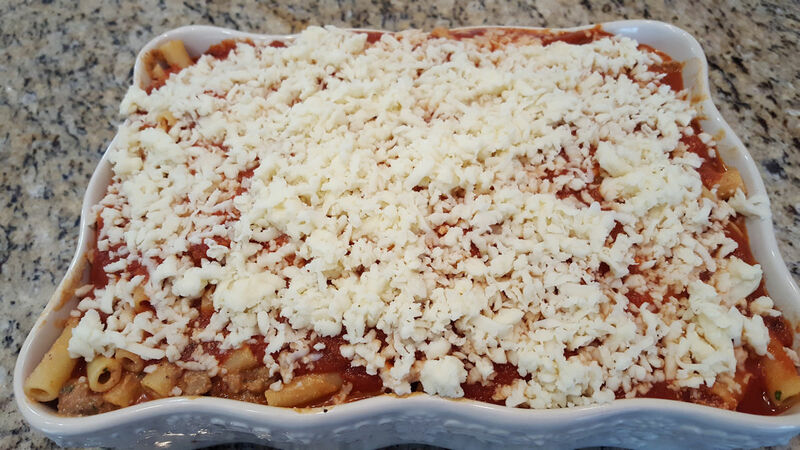 To assemble the ziti bake: Add the hot pasta to the meat mixture, stir to combine. Add the ricotta cheese mixture and one jar of the pasta sauce. If needed, add a little of the reserved pasta water. Stir to combine well. In a large baking dish, first layer half of the meat mixture, topped with half of the Parmesan cheese, half of the Romano cheese, half of the second jar of sauce and half of the shredded mozzarella cheese. Repeat, finishing with the mozzarella cheese. Bake for 45 minutes in a preheated 350 degrees F oven until bubbly and hot in the center. I like to cover my ziti bake with parchment paper and then aluminum foil to keep the cheese from browning too much. Remove the foil and parchment paper for the last 15-20 minutes of baking time. 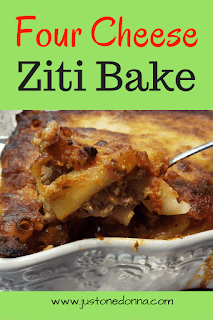 If you are baking after chilling the ziti bake in the refrigerator, let the ziti bake warm on your counter for at least thirty minutes. You may need to extend your cooking time. Thank you for sharing this blog post with your friends.